It is difficult to convert online power into offline power to achieve political change. [UPDATED] This month John Palfrey and Urs Gasser published a book calledInteropabouthow complex systems work together. This concept applies to digital activism as well, because successful activists must convert online power into offline impact. It’s not always easy. Even outside the realm of activism, interoperability is often lacking. You know how your iPhone charger won’t plug into your friend’s Nokia phone? How your Mom’s old version of Word won’t open your new .docx file? How you can’t plug your hairdryer into a European socket? These are all examples of technologies that should work together but, because of design choices, do not. We can think of the interaction of online space and offline space in a similar way. Theworld of bits and the world of atoms, in Zeynep Tufekci’s terms, are two complex systems. Sometimes they interoperate well: think ofonline payments. When you buy something online, your bank account reflects that change. When you take cash out of an ATM, you can see that change when you log into your account online. Sometimes they don’t. Think ofonline dating. Someone can look great on their profile and sound great in their emails, but when you meet, you have absolutely no chemistry. Activism is another activity for which interoperability between online and offline space often does not work well. The Kony 2012 campaign gained more video views in a shorter period of time than any digital video in history. One can assume that at least some of these 100 million+ viewers were honestly moved by the documentary and wanted to do something to catch Kony and help child soldiers. But there was a problem with interoperability. That intensity of interest and concern online did not convert into the capture of Kony offline. The realities of international politics and central Africa geography refused to interoperate with the aggregation of interest and will that the network permitted. In Egypt, activists were able to use a blog community and a Facebook group to grow a small, young, liberal, and pro-democratic civil society in the early 2000’s that was critical in bringing down Mubarak but is still under-strength when compared to much older and better established groups like the Muslim Brotherhood. This is the problem with many instances ofso-called “slacktivism”– the organizers were unable to figure out how to transform online interest into offline impact. They could not figure out how to get the two systems to interoperate. Even when solutions are found, they can have a short shelf life as the opponent counter-innovates. Just think of once-formidable Wikileaks. Interoperability is difficult because online and offline spaceareradically different systems with radically different rules. It is difficult to transfer power between the them. The offline world is geographically-divided, money-driven, and hierarchical. The online world is networked, free/low-cost, and peer-based. Trying to transfer networked people power into a hierarchical political system can run up against fatal rode blocks. Trying to transfer massive online interest into massive offline action is also difficult, even when trying to mobilize a single group of individuals. Even these distinctions blur, because the two systems influence one another. We have seen ways in which the offline space has influence the online and vice-versa. The Pirate Party brought the peer production of the network into the hierarchicalstructureof government. The Chinese government used censorship technology to create its own national intranet that would match its geographic boundaries and abide by its national laws. Successful interoperability between online and offline worlds requires a strong understanding of both, from the mechanics of Twitter to the arrest process used by the capital police. Yet someactivists are figuring out how to digital and physical space can interoperate better. InSpain, activists used quick and peer-based crowdfundingsubmit a legal complaint to the slow and hierarchical Spanish judicial system. 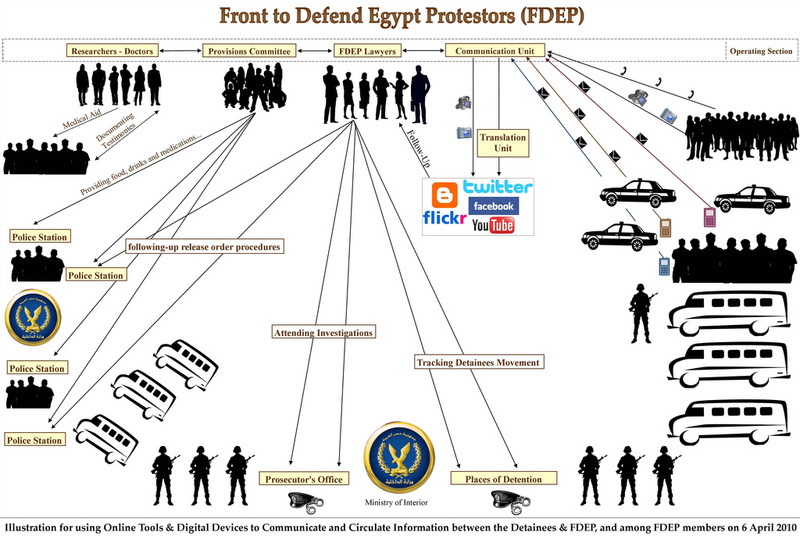 In Egypt, theFront to Defend Egyptian Protesters has worked out a resilient system (image, left) to link protesters in danger with offline assistance by using a range of digital tools. Interoperability is not easy, but it is possible, and activists are understanding it better every day. It seems intuitive to me that the interface between ‘the world of bits’ and ‘the world of atoms’ has got to be maps and geographic representations more generally. They remind you that, as much as you are in the world that the computer/phone/tablet screen is showing you, you are also in the world that you can see in front of you. They also help you connect and emphasis with others: we can all imagine an aerial image of our home town being next on the stream of Dronestagram. Especially as more devices become location-aware (my Google Chrome seems to know exactly where my laptop is even without GPS!) it seems that there is a really opportunity to take people from online expression to real-world action. Have you found any evidence for or against this in your work? Hi Duncan – Digital activism has always linked back to the “real world.” The vast majority of institutions of power, which digital activism seeks to influence, exist offline, so at some point that leap must be made. Also, it very rare for a campaign that uses digital technology to ONLY use digital technology. Sometimes digital tools are used to mobilize offline action. Sometimes tactics that do not require digital tools are used in tandem with digital tactics (for example, collecting signatures via an e-petition and tabling at a university). Digital activism has engaged and continues to engage people in real-world action. First of all apologies for the previous comment littered with typos. I agree absolutely – I don’t buy the slackivism argument that the two world are not linked. That said, it still a challenge for us to funnel people into real-world action (which is some times necessary) and I’m interested in what tools and techniques afford that transition. Does geo-location do it? If not, what does? Geo-location has some value for activism, but I still see that value as narrow. For example, I could see an organization asking supporters to install an app that would allow them to receive action alerts depending on where they are (for example, volunteering opportunities). However, for most geographic information, geo-location is superfluous. If you email supporters and say “protest Sunday at Murrayville Town Hall,” everyone in Murrayville already knows where that is. If you are dealing with a geographically dispersed supporter group, then you will need geographic data, but it can be self-reported via zip code. GPS-level accuracy is not necessary. The challenge is really in motivating people to take action offline, not using software that gives you their location. The basic strategy of motivation is the “ladder of engagement” – get mildly interested people to give you their content info (ie, an email address). Use that contact to ask them to take small actions (for example, micro-donations). Record in your database who takes the action, and then ask people who do smaller actions to do larger actions (ie, host a house party). A database with specific data on where on the ladder of engagement a supporter is will be more useful in getting them to take action offline than any GPS app.